269 images in this album on 30 pages. 1978 photo of my father Mr. L.F. Newlands, V.P. of the Oregon Portland Cement Co. Bicycle provided by Bruce Freeman who also took the photo in front of the US Bank building. Bowler and fancy umbrella kindly provided by John Helmer Clothing Co.
Pat Johnson on the pump. Ted Johnson holding the bike. Photo take by Bruce Freeman sometime in the 1980's in the North Park Blocks, Portland, Oregon. MAC Club Team. Strawberry Andy is the bald guy on the right. I may be bald but I'm slow. 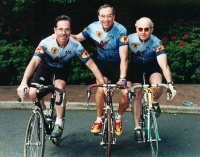 The good looking guy on the left is Mr. Jerry Powell and the speedster in the middle is Mr. Bud Morris. A Strawberry makes it to the Col de L'Iseran, French alps, September 2005. 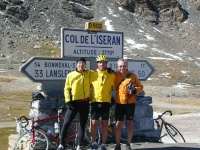 Jim Draudt, Rob Witsil and Dave Worthington made this the highest point of many highs during a week through the alps. "The Strawberry was fantastic" Draudt reported, "light and tight going up, rock solid going down." ps. Jim was paid very little for these glowing comments. Andy N.
Ollie at Shotgun in the 1964 Datsun shop pickup, November, 2005. 2006 SB Bike trip. Dave Ristig and a buddy are shown here on a bike ride just prior to the 2006 edition of the Tour of California. Dave was not paid anything for his rave reviews of his new Strawberry bicycle, but it is reported that his buddy had a hell of a time keeping up with Dave while riding some bike made in upstate New York. 2006 SB Bike trip. Another pic of Dave and friend riding along the coast north of Santa Barbara. Note: buddy has just about dropped off Dave's wheel. That S-----a bike just can't keep up with a Strawberry. Strawberry World Headquarters, Portland, Oregon, circa summer of 2006.